On August 27th, 2018, Rule of Law Collaborative (ROLC) Director Joel Samuels met with a visiting delegation of military officials from the Republic of Colombia. In this meeting, Professor Samuels and the delegation discussed rule of law and human rights topics in the context of Colombia’s peace process. 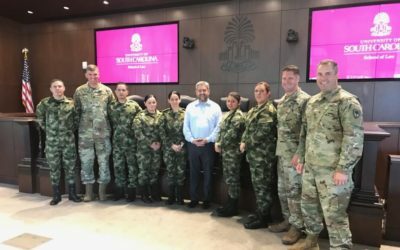 This is the third opportunity that ROLC has had to meet with Colombian delegates through a relationship with the South Carolina Army National Guard and its State Partnership Program, and ROLC looks forward to continuing exchange.